As Egypt is the gift of the, Nile, Constanti­nople. is the gift of the Bosphorus. The Bosphorus is the determining factor in its physical confor­mation, its appear­ance, life, and history. Without the Bos­phorus there would be no Constantinople. Blot out the Bosphorus, plant a plain or plateau over the space occupied by its channel, and the Black Sea would be but another Caspian, shut off from the currents of mankind, itself unmarked by any great event and of only insignificant influence and importance to humanity. Had there been no Bosphorus, the world's history of these thousands of years would have been largely modified and perhaps reversed. That slender, sinuous stream is barely a score of miles in length. It is nowhere more than three miles broad. Half-way in its course it narrows to less than seventeen hundred feet in width. In relative space occupied it is trivial. Upon the largest map if appears to be hardly more than a crooked line. And yet it has been the highway of the nations from antiquity. It has united Europe and Asia instead of keeping them apart. In its romance and poetry and in its shaping of destiny, no less than in its natural beauty and variety, it is unrivaled by any stream in the world. The city which rises upon it is unique. It is partly in Europe and partly in Asia. No other city is built upon two continents. The crescent of the Golden Horn cuts into it sharply like a sickle for the distance of over five miles. No other city is pierced at its very heart by such a bay. Other cities have grown along the banks of rivers, or upon the shore of some sea, and their develop­ment and expansion have been largely the result of location. Yet not one other has possessed a main artery for com­munication and commerce comparable with the Bosphorus. Constantinople, the first Christian city erected on the ruins of vanquished pagan­ism, immortalizes the name of the first Christian emperor. But it is not the monument so much of his devotion as of his political sagacity. 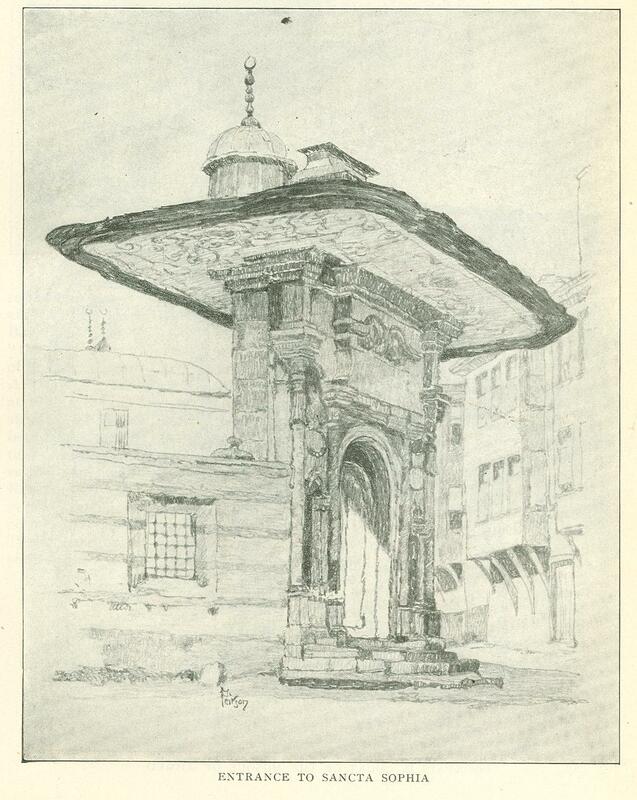 "No city chosen by the art of man has been so well chosen and so permanent." Constantine well deserves, despite all his crimes and follies, the title of The Great, which history has decreed him. Yet that quality of political sagacity, with which he was endowed as few men have been endowed in any age, constitutes his chief claim to greatness. Not so aspiring and great soled as Alexander, less cosmopolitan and broad-minded than Julius Caesar, he, as few sovereigns have ever done, realized the necessities and understood the spirit of the time. 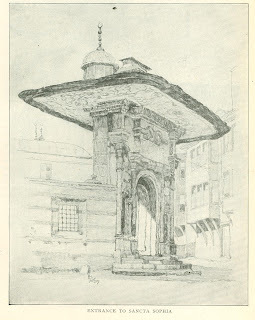 Some of the, considerations that deter­mined his choice of a site for a needed new capital were made weighty by the condition of affairs in the fourth century. They were temporal in their nature, and there is no reason to discuss them here. For example, that there are seven hills in the Nova Roma on the Bosphorus, just as there are seven hills in the Vetus Roma on the Tiber, is to the mind of today only an interesting coincidence. But to the mind of the fourth century Roman, as to the mind of Constantine, this topographical fact was not only a palliation, but a reason for the change. Other considerations that justified his choice have lost nothing of their moment with the passing of time. They are per­manent in their nature, and as powerful in the twentieth century as they were then. Among such considerations two are specially prominent - the material and the strategic. The material has to do with the main­tenance and support of the inhabitants. It takes into account the means of liveli­hood, the supply of food and water, the opportunity of occupation, the certainty that individual and municipality alike should enjoy prosperity and acquire wealth. This material requirement was and is admirably met in the situation of Con­stantinople. Water is abundant and pure. Food is easily obtained and cheap. The fertile plains, which. reach east, and west from the strait, reward a minimum of labor with vegetables and fruits in profusion. But it is the Bosphorus which furnishes the people with their principal and unfailing supply of food. Whatever befalls harvests on land, whether freshets, drought; or hurri­cane, the inhabitant of Constantinople, will not starve. From remote antiquity the strait has been called "the fishy Bosphorus.'" The epithet golden in the name Golden Horn has reference to the wealth which the fishermen derive from the finny treasures in its waters, and not to its golden sunsets or the golden-haired son of Io who, tradition declares, was born upon its banks. In successive shoals, in multitudes which baffle imagi­nation, seventy varieties of edible fish migrate northward through the spring and early summer from the Mediter­ranean to the Black Sea, and back again to the Mediterranean from the Black Sea at the approach of winter. And other shoals, only less numerous, remain in the Bosphorus and in the neighboring waters of the Marmora and the Black Sea throughout the year. No other city possesses such exhaustless provision against hunger, not merely at its door but within its very boundaries. Moreover, the material requirement is more than satisfied by the situation of Constantinople, relative to the rest of the world. It is a toll-house upon a world thoroughfare where the tribute of millions of human beings must swell its coffers. It stands upon one of those infallible routes which nature has indi­cated, which man is powerless to super­sede, and along which the products and exchanges of opulent lands, both nearby and remote, must pass in stable and in adventurous commerce. In accord­ance with the law of gravity, the rivers seek the sea. In accordance with that same law, the Danube, the Dnieper, the Don, the Kizil Irmak, pour upon the bosom of the Black Sea what­ever the vast Hungarian and Russian plains and the great plateau of Asia Minor produce. The prolific territory drained by those rivers equals in area nearly a third of Europe. 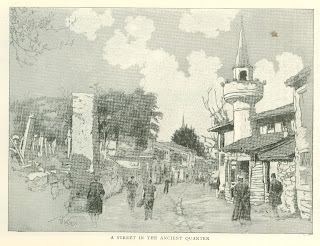 The only outlet is the Bosphorus, itself the main roadway in Constantinople. Whatever the lands upon the Mediterranean send back in return must enter by the same path. Almost always a city has been a grad­ual growth from some insignificant begin­ning. Generally it has started as a settlement by pioneers or exiles or colo­nists, whose choice of location has been determined by the crudest and almost wholly material reasons. Thus did the an­cient metropoles of Babylonia and Assyria and Egypt develop on the Euphrates and the Tigris and the Nile. So, too, have come up the great majority of the populous municipalities of Europe and the New World. But when some leader at the head of an army or some ruler at the head of a nation has desired to select a site for settlement, the strategic con­sideration has usually been no less prominent in his mind than the material. The strategic takes into account posi­tional advantages, on the one hand, for resistance against attack, and, on the other, for the waging of offensive warfare. Alexander, who founded more cities than any other maker of history, always kept this consideration in the foreground. So, too, did Peter the Great. So, too, preeminently did Con­stantine. From the southeast of Europe a penin­sula, eighty miles in length and varying from fifty to twenty miles in breadth, extends eastward between the Black Sea and the Sea of Marmora. From the extreme southeastern end of the penin­sula a many-ridged plateau in a sharp triangle projects toward the east. At the extremity of this land triangle stood upon two hills in the time of Constantine the tiny city and acropolis of Byzantium. This bit of land had resisted with success the prolonged assault of the Macedonian Philip at the summit of his power. In the second century after Christ, during a constant three years' siege, it withstood the forces of the Roman Empire, commanded by the Emperor Severus himself, and the garri­son yielded only to starvation. If the city was then so strong with its scanty garrison and few inhabitants, when a mere outpost between two seas, a mere frontier colonial settlement, what might it not become in an Emperor's and an Empire's hands! Many conditions of warfare have so changed that a stronghold impregnable to assault in the early centuries of the Christian era might be practically help­less against the weapons of today. The massive and lofty walls which once surrounded the city of Constantinople and rendered it the best fortified capital on earth, still awe-inspiring in their majestic ruin, could, even if restored, now pro­vide little resistance against a foreign army. A determined invader would not reckon them in his account. But the advantages bestowed by na­ture and manifested in neighboring and distant environment have diminished in no degree. By water there is no ap­proach to the city except down the Bosphorus from the Black Sea or up the Dardanelles from the Aegean and Medi­terranean. But the opposite shores of those straits are so close together and the encircling hills are so close upon the shore and so enfilade the channel that the passage of a hostile fleet can be made well-nigh impossible. On the rear or westward side of the city, barrier after barrier interposes against invasion by land. The Danube guards the entire northern frontier of the Balkan Penin­sula. South of and almost parallel with the Danube extends from sea to sea the mountain wall of the Balkans, pierced by few passes or gates, each pass capable of being made a new Thermopylae. South of the Balkans stands the mighty natural fortress where the Emperor Hadrian built the city of Adrianople, which commands the entire plain of Thrace. Suppose the Danube, the Bal­kans, and the natural fortress are over­come; there still remain nearly a hun­dred miles of marshes and shallow lakes and mountains, interspersed and difficult of passage. So it is not strange that in the last well-nigh five hundred years, since the fall of the Byzantine Empire, while Paris and Rome and Vienna and Berlin and Moscow and Madrid have been captured again and again, Constantinople has but once looked out upon a hostile camp fire, and has but once beheld a victorious army of her foes. This record is largely due to the relative impregnability or inaccessibility of her situation. Yet that situation is no more favorable for successful defense than for action on the offensive. Able to issue from or withdraw within the Bosphorus and the Dardanelles and to close them as doors, she occupies vantage ground for delivering attack which surpasses that possessed by any other European capital. It is true that the role of Constantinople in history has been mainly defensive, but it is not difficult to discover the cause of this fact. Through most of the fifteen hundred and seventy-eight years since the foundation of the city by Constantine, it has been held by an empire in decay. From the close of the sixth century until the overthrow by the Ottomans, or Turks, in the fifteenth century, the Byzantine Empire was in a state of tedious decline, of slow, inevitable dissolution. The Ottoman Empire likewise has been passing through the same apparently interminable dissolution ever since the reign of Sultan Selim II, who lost the battle of Lepanto in 1571. In both cases the city resisted the process of decay, and prolonged the existence of the empire of which it was the heart. That is, the continuance of the Byzan­tine Empire during its last weary cen­turies, and of the Ottoman Empire in more recent times, was primarily due to the possession of Constantinople. Had neither held Constantinople, each would have disappeared long before. Napo­leon, poring over the map of M. de Meneval and realizing the material and strategic advantages of the situation, might well exclaim, "Constantinople! It is the empire of the world!" The empire of the world it would be now in the hands of any of the vitalizing peoples of the West. The name Constantinople is now applied to a much larger territory than in the Middle Ages. Under it is in­cluded in one municipal system the entire group of cities or wards or districts on and immediately adjacent to the Thra­cian Bosphorus. Though each of these districts has a name to itself, has its nominal boundaries, its special charac­teristics, and its own individual history, there is often no visible line of demarca­tion, the houses in one press upon the houses in another, and even the old-time resident may be at a loss to distinguish where one district ends and the next begins. Of these cities or districts, composing the capital, three are of special promi­nence. They are Stamboul, Galata-Pera, and Scutari. Of these Stamboul is by far the larg­est, most populous, interesting, and im­portant. It is to Stamboul that the traveler first turns, and there he lingers longest. Stamboul includes nearly all the Nova Roma of Constantine, of which it is double the size. It even preserves the name of the founder, the word Stam­boul being a Turkish corruption of the word Constantinoupolis. This district exactly corresponds with thirteen of the fourteen Climata or Regions which com­posed the Constantinople of Theodosius II and the subsequent Byzantine sover­eigns. Its topography has been greatly modified in the last fifteen hundred years. In this transformation fire has played the chief part. The fires have been so frequent and so destructive that the city has been built from its founda­tions on an average twice every century; that is, more than thirty times Since it became an imperial capital. As the valleys have gradually filled, the seven hills, never more than three hundred feet in height, have become less prom­inent than they were to the eager eye of Constantine, But they may still be dis­tinctly traced. Stamboul is a triangular peninsula, more than ten miles in circuit. 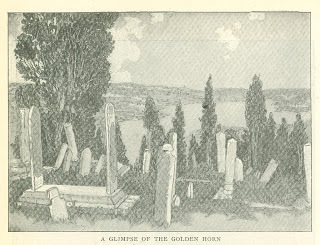 On the north is the Golden Horn and on the south the Marmora. Its eastern apex, a blunt, low promontory, projects into the Bosphorus. On its long western side it is shut in by the still standing though dismantled Theodosian walls. Close outside those walls stretch the packed graveyards of prodigious extent. Through these graveyards, rudely parallel, its white line distinguishable amid the wilderness of burial stones and cypresses, runs the old Roman and Byzantine Triumphal Way. Turning sharply to the east or left, it ends between two square and lofty marble towers in the Golden Gate. For a thousand years in what is now Stamboul the Emperor and the Patriarch resided. Here the Byzantine State and Church erected their palaces and sanc­tuaries. Here the dynasties plotted and counterplotted and rose and fell. Here the creeds were wrought, to be anathe­matized or accepted as God-inspired - at Ecumenical Councils. Meanwhile this was the most cultured and refined, almost the only civilized, city on the globe. Not all the monuments of the past have dis­appeared. 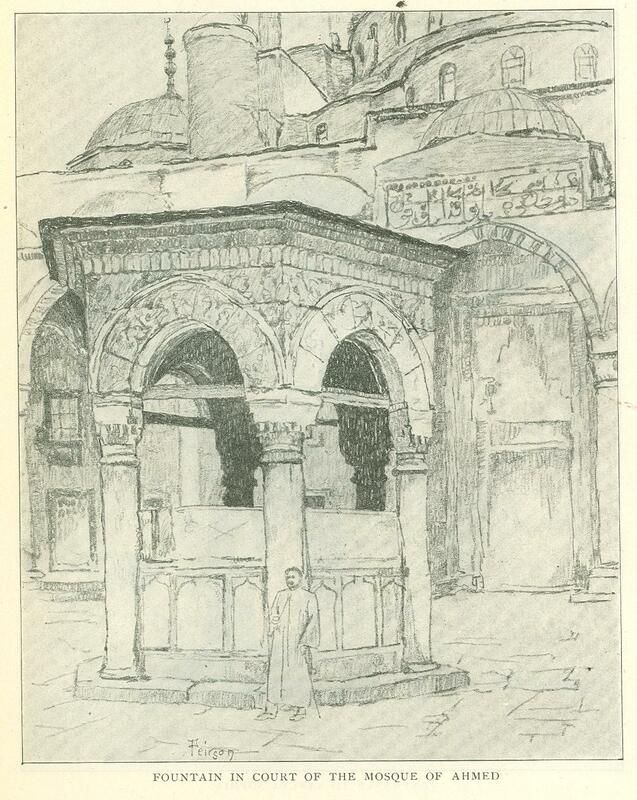 Here stood and still stands Sancta Sophia, the Aghia Sophia of Justinian, the Aya Sofia Djami of the Moslems. 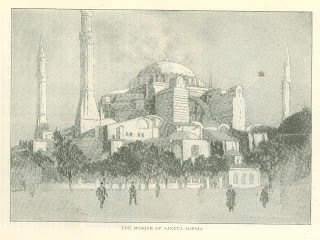 And today, though more than thirteen centuries have passed since its erection, that venerable pile is, in the audacity of its architectural design, in the impressiveness of its interior and in the accumulated associations of its his­tory, without a peer and almost without a rival among Christian churches. In Stamboul may still be seen the Imperial Columns, shattered but erect; the enormous Roman cisterns, the vast­est ever constructed, which once stored sufficient water to sustain the populace through many months of siege; more than a score of Byzantine churches, long since transformed into mosques but with dimmed mosaics visible and the battered crosses upon their walls; the Atmeidan on the site of Constantine's Hippodrome, the Built Pillar at one end, the Obelisk of Thotmes III at the other, and, between, the priceless Serpent of Delphi, all rising as from sunken pits from the former surface of the Hippodrome, buried by time a score of feet below. Since the Conquest Stamboul has been the delight of the Ottomans. On its extreme eastern hill, where once stood classic Byzantium, they planted the Seraglio of the Sultans, the Oriental palace of an Oriental despot, its name signifi­cant to the Western mind of every human experience of a paradise and a gehenna. Though deserted as a habitation since early in the last century, it is not allowed to fall into decay, and with its treasure­ house and kiosks tempts and rewards the curiosity of the tourist. 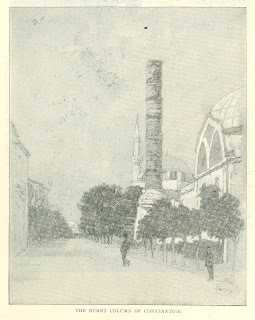 On the third hill looms the Tower of the Seras­kier, from the top of which, the loftiest point obtainable in Stamboul, may be enjoyed the most comprehensive view of the Ottoman metropolis. At its foot lie the mazy, intersecting, interminable lines which indicate the bazaars with their fabled wealth. Beyond is seen, not only to the west but in entire periph­ery of the city, the continuous wall, summarizing the thirty sieges which have beaten against it in the eleven centuries which separate Constantine I the Great, the Founder, from Constantine XIII Dragoses the Heroic, under whom the Empire fell. Their mosques are the noblest achievements of the Ottomans. To the service of their faith they, like the classic Greeks, have consecrated their best. Of these there are four hun­dred and ninety-one in Stamboul alone, Those built by the Sultans and styled Imperial are the most stupendous. 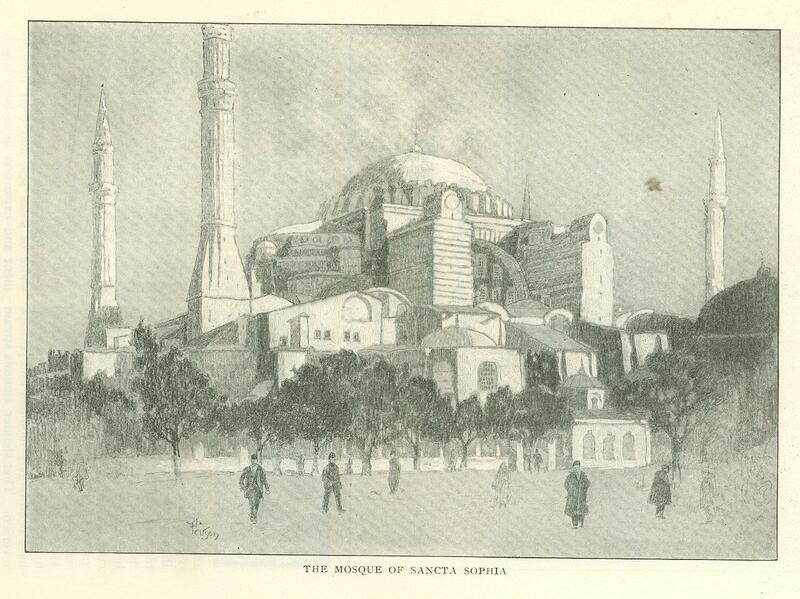 All these are a partial copy of Sancta Sophia. 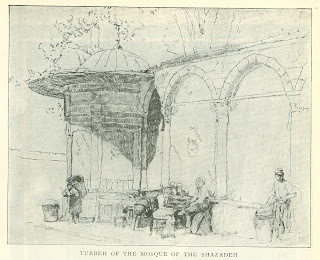 Four are preeminent: the Mosque of Mohammed II the Conqueror, the Mosque of Selim I the Ferocious, the Mosque of Souleiman I the Sublime, and the Mosque of the Shahzadeh. Each seems to incarnate in stone the character of its founder. 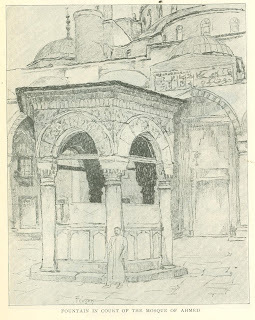 Each founder with his family lies in a turbeh or chapel close to the sanctuary he built. Next to Stamboul in importance, directly north across the Golden Horn, on the immense plateau which projects between the classic Cydaris and the Bosphorus, are the interwoven cities of Galata and Pera. Two typical Eastern bridges, spanning the Golden Horn, join them to Stamboul. The conglomerate population of the capital, men and women of every clime and language and faith, clad in every possible garb, present a panoramic picture of the city's life, such as can be beheld nowhere else. Galata was a medieval settlement of the Geno­ese. It was walled and strongly forti­fied. Independent of the Byzantine Emperor and Empire, it was a constant menace to both. A few rare portions of the Genoese wall and some of the Genoese houses are still preserved. The most striking feature upon the hill of Galata is the vast white circular tower whose dizzy conical top dominates the landscape. 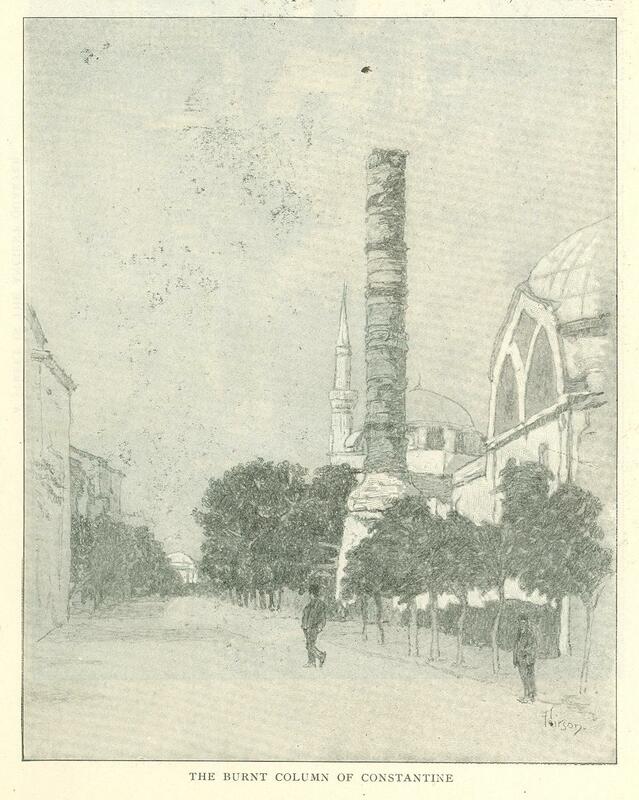 The region outside the limits of Galata was formerly called Pera, or the Beyond. The name Pera has clung to the locality, now densely populated. The Turks often derisively speak of it as Giaour Pera, Infidel Pera, because almost wholly inhabited by Franks. Here are great hotels and the winter palaces of the ambassadors. The only foreign minister residing in Stamboul is the envoy of the Persian Shah. A frightful fire in 1870 destroyed the British Embassy, the American Consulate, and more than three thousand houses. Over a thousand persons lost their lives. Now, with its broad streets and high buildings, its inhabitants all clad in European attire, Pera shows few traces of the East and resembles a European city. Yet one such feature it does possess. By some strange irony of fate, the tekieh or con­vent of the Mevlevi or Whirling Dervishes is located in the infidel city, on the bound­ary between Galata and Pera. Opposite and east of Stamboul, partly on the Asiatic shore of the Bosphorus and partly on the Sea of Marmora, sloping upward on a steeply ascending trian­gular promontory, is Scutari, the third of the three principal city factors. It occupies the site of ancient Chrysopolis, and its eastern boundary touches the limits of still more ancient Chalcedon, the "city of the blind." Galata-Pera is European and seeks to imitate the West. Stamboul is in transition, facing in both directions, half Oriental, half Occidental. Scutari is wholly Oriental, Asiatic, Mussulman. It is made up of two great cities, each jammed into and encroach­ing upon the other, a city of the living and a city of the dead. Houses mostly small, generally unpainted, pierced by latticed windows, the dwellings almost piled upon one another, compose the first city. The second covers almost as great an area as the first, and is occu­pied by a population many fold more numerous. This is the vastest and most densely crowded Mussulman graveyard on earth. Seen from the Bosphorus it is most impressive and imposing. Its gigantic cypresses stretch onward, an endless, continuous mass of perennial green. In the cemetery outside the walls of Stamboul are housed countless hosts of Armenians, Jews, Greeks, and Mussul­mans, each in his own section. In the cemetery at Scutari rest none but the followers of the Prophet. Only when one has lost himself in its mazes does he realize its extent. On its main avenue, close to the entrance, is the tekieh of the Roufai or Howling Dervishes! Toward the north, away from Scutari, Galata-Pera, and Stamboul, stretches the Bosphorus on its erratic course of more than twenty miles. From the hill of Boulgourlou, in the rear of Scutari, is obtained the most panoramic and en­trancing view of the strait. The stream does not so much wind as bend, each sharp cape or retiring bay on one side corresponding to bay or cape on the other. Eight promontories altogether on the east and west thrust themselves out as against eight opposite bays. This startling conformity of outline, this rude adjustment of shore to shore, carries imagination backward to the time when resistless natural forces wrenched Europe and Asia asunder. The entire upper Bosphorus and the Cyanean Islands, "the winged Symplegades," at the mouth of the Black Sea, reveal volcanic origin. At places the banks are precipitous and at others they gently recede in gradual slopes. Sometimes a bay is hemmed in between two abrupt, rocky cliffs. some­times at right and left are spread broad, verdant, and flower-studded meadows. But the houses, palaces, churches, mosques, edifices of every form and color and purpose, are without a break. They constitute a ceaseless fringe of picturesque variety. In gaunt relief stand out castles of the Genoese dating from the Crusades, crenelated Ottoman fortresses contemporaneous with the Wars of the Roses, and earthworks equipped with the most modern artillery, The Bosphorus is the stream of charms, but in two is it preeminent. The one is natural beauty, which intoxicates the eye and in which the senses revel. The other is an exhaustless wealth of association, legendary, mythological, po­etic, historic, at which the mind is con­founded, a medley of all that the races and the ages have dreamed and imag­ined and believed and practiced and taught.